There are few things more universal than a good cup of coffee, whether to wake up with in the morning, to share a chit-chat with girlfriends over, or to cozy up with while relaxing in the evening, most of us can agree on the wonder that is coffee! Today, we've got a whole "latte" of coffee-themed inspiration for you! You might want to grab a cup while you peruse today's group of blog posts from the whole team! I've designed a new coffee set to celebrate all of the coffee lovers out there! The stacked coffee cup image will be fun to color or watercolor, customizing combinations to suit your project. The sentiments are all "build-able" with large script words that can further incorporate your color schemes. All of this will complement Erin Lincoln's new Coffee Cozy die line-up as well! Latte Love will be available for purchase on August 15th. Latte Love contains a total of 22 images. The stacked cups image measures 1-1/4" x 2-5/8". The small "I love coffee" label measures 1-1/4" x 3/8". The certified coffee drinker circular label measures 5/8". The large script "coffee" measures 1-1/8" x 5/8". 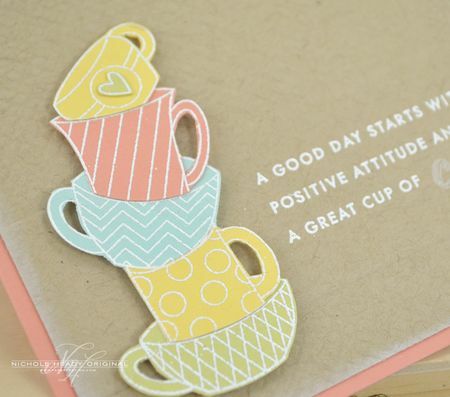 "A good day starts with a positive attitude…" measures 1-7/8" x 5/8". "Grind Scoop Bre Pour Sip" measures 5/8" x 1-3/8". Erin Lincoln has hit it out of the park again with this collection of amazing dies that will allow you to create custom coffee cozy designs to keep for yourself or give as gifts! For the main Coffee Cozy building, you can use paper, felt or even fabric. If you wish to stitch the pieces together yourself, you can use the "edger" style die to pre-cut your holes for you. You will love customizing your cozies any way you'd like!! Coffee Cozy die collection will be available for purchase on August 15th. Coffee Cozy die collection contains a total of 3 dies. They measure 5-3/4" x 2-1/2" (A), 4-3/4" x 2-1/2" (B), 2-1/2" x 1/2" (C). The assembled coffee cozy measures 2-1/4" tall and can vary in circumference depending on which pieces you combine. How to make a paper coffee cozy. Why it is handy that the Coffee Cozy Die comes in two pieces. How to make a felt coffee cozy. 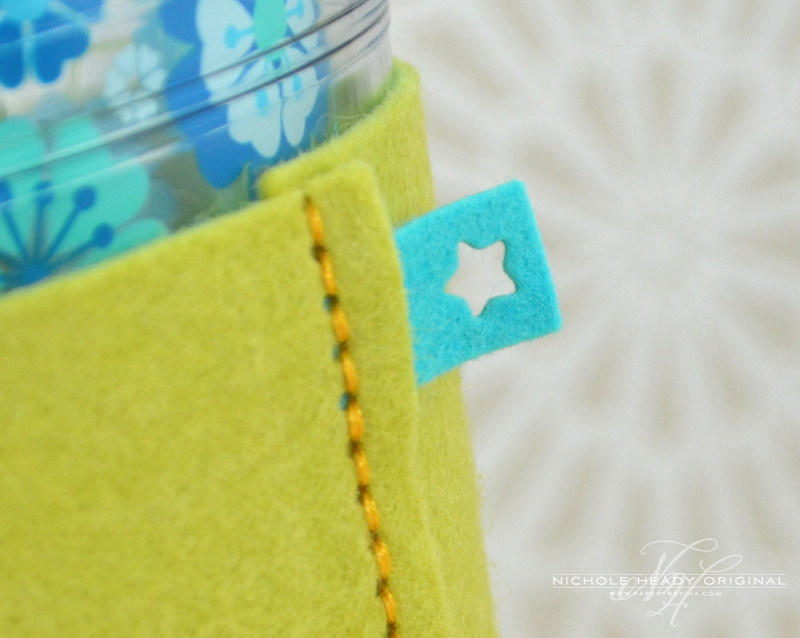 How to add optional stitch holes to your felt cozy so you can sew it up with ease. How the Coffee Cozy Detail Collection dies work together with the Coffee Cozy Die. How to stitch up your felt coffee cozy. How to resize your felt coffee cozy to fit both paper coffee cups like those found at Starbucks and the like and the larger, reusable Copco coffee mugs that you can purchase just about anywhere. How to make wrist cuffs for a super hero costume. 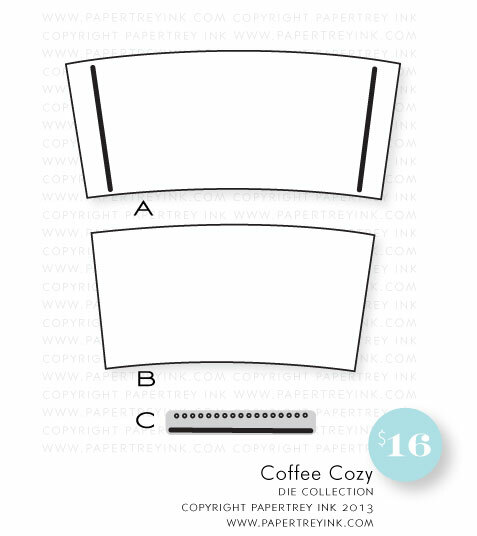 As a follow-up, Erin has also designed a set of dies that you can use to personalize the Coffee Cozy further. For the large shapes, cut the holes only portion of each shape set from the coffee cozy itself. You can then follow up with the complete shape cut from an alternate color and stitch it right onto the coffee cozy, lining up the holes. SUPER easy! 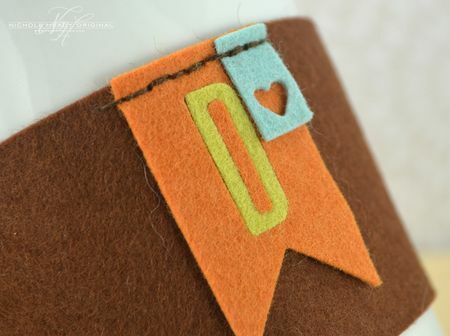 You can also add a small tag to seam of the coffee cozy using the adorable little tag dies that Erin designed to complement the shapes. The coffee cozy possibilities are virtually endless! Coffee Cozy Details die collection will be available for purchase on August 15th. Coffee Cozy Details die collection contains a total of 7 dies (6 single shapes + 3 wired shapes). They measure 1-1/2" x 1-5/8" (A & B), 1-1/4" x 1-1/4" (C&D), 1-1/8" x 1-7/8" (E&F), 1-1/4" x 3/4" – individually measuring 3/8" x 3/4" (G). For my first project I put together a little something that is perfect for a friend or co-workers summer birthday. Pair it up with a Starbucks gift card for them to go and get iced coffee or some special iced tea packets. I started with this sweet card. I die-cut white cardstock with the plain die from the Notched Star Banner die collection and Hawaiian Shores with a Sketched Shapes die. On the white banner I heat embossed the stacked cup image with White Filigree Embossing Powder and watercolored it using ink refills, water and a small watercolor brush. I just love watercoloring heat embossed images because the "walls" created with the embossing help hold the color in place and result in a more professional finished product! TIP: I always put quite a bit of water on my brush when watercoloring with ink refills, therefore diluting the color a lot. I like to go back in to each area of the image while it is still wet and add just a dab of the full strength ink refill to create shading. It only takes a few extra steps, but it makes a huge difference in the final outcome. The sentiment was added to the bottom of the tag using True Black and Simply Chartreuse inks. I layered the two banners on top of one another, adding a bit of stitching to the top with white crochet thread. 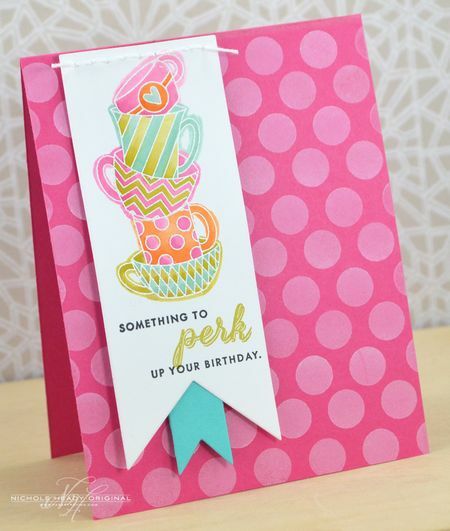 The Raspberry Fizz card base was stamped with Polka Dot Basics II using Fresh Snow ink. This is a standard size insulated cup and I was able to use two of the large pieces die cut with the largest Coffee Cozy die to create a perfect fit. This was done with Simply Chartreuse felt. I die-cut the stitching holes from the center front of the cozy before assembling it. I die-cut the heart from Raspberry Fizz felt and placed it on top of the stitching holes that were cut in the Simply Chartreuse felt. I then stitched it in place using a blanket stitch, just to do something a bit different. Having all of the stitching holes pre-cut for you makes the job SO much faster, easier and the final product neater and perfectly spaced! When I stitched up the cozy, I added one of the little die-cut star tags into the seam. It was cut from Hawaiian Shores felt. This may seem like just a little touch, but it really brings the whole cozy to a higher level. Plus it's just so darn cute! I love how this turned out and I'm looking forward to *gifting* it to someone special very soon! For those of you who might not enjoy coloring or watercoloring, I thought I would show you how adorable these little cups look when they are paper pieced. To begin this card, I impressed the top 3/4 followed by the bottom strip of the Classic Kraft card front with the Rustic Burlap impression plate. This left some space to add the sentiment later. I swiped the edges with Fresh Snow ink to help bring out the texture a bit. I heat embossed the stack of cups onto four different colors of cardstock using White Filigree Embossing Powder. I then cut out the individual cups and adhered them together using a 2-way glue pen. The sentiment was heat embossed as well, with the word "coffee" added in Fresh Snow, giving it a softer look that contrasts with the embossed companion sentiment. 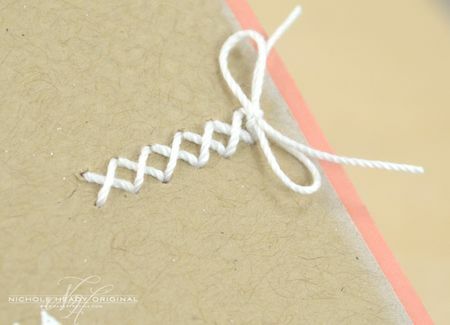 To help carry the eye to the right of the card, I added some stitching that ends with a bow using white crochet thread. All of this was mounted onto a Melon Berry card base. For my last projects today, I wanted to showcase a masculine take on the stamp set and on a cozy. I made this for David since he is an avid coffee drinker and I know he will get a lot of use out of it. To begin with, I created the card. I die-cut the Spiral Notebook Page from white cardstock and stamped the stacked cup image onto it using Noir Palette ink. I then colored the image in with Copic markers, outlining it with T1 for a bit of shading. The sentiment was added vertically for something a bit different. I stamped the main part of the sentiment in True Black, then added the heart with Scarlet Jewel. "Coffee" was added with Charcoal Palette ink. I used one of the Coffee Cozy Details dies to add a small heart detail in the bottom corner of the card. I just LOVE what Maile has been doing lately with diagonal strips of backgrounds on her cards so I wanted to try one out. Really adds a little something unique. I stamped this Scarlet Jewel strip with the argyle image from Autumn Pattern Pieces and roughed up the edges a bit for texture. This is a travel mug from Starbucks, one of my personal favorites because you drink from a ceramic edge rather than plastic! I used two of the large coffee cozy pieces to assemble this from Dark Chocolate felt. I die-cut a banner from the Sketched Shapes die collection and added stitching holes to the top of it using the little edger die from the Coffee Cozy die collection. Love that little thing! Anything with a straight edge can now have stitching holes added to it! I also die-cut the letter "D" from the banner using the Headline Alphabet die. I die-cut a second "D" from Simply Chartreuse felt and embedded it into the banner. The tiny heart tag was die-cut from Ocean Tides felt. I stitched these details into place, then used a bit of tacky fabric glue to adhered all portions of the "D" to the actual coffee cozy. Now that you have seen a few of my creations, here are some of the amazing things that the team has created! NOTE: Unfortunately Danielle Flanders box containing all of the new release products was lost by the shipping carrier and did not arrive in time for her to design her projects. We know you will definitely miss seeing her spin on things for today's post! But don't fear, we will be bringing you a special presentation of her August Release projects in the September 1st newsletter, so there is something to look forward to later in the month! I hope you have enjoyed all these amazing creations that both the team and I have shared with you today! Are you excited to create a few coffee-themed projects for yourself? Or what about for gifts this fall or even this holiday season? We would love to hear your initial thoughts on everything we introduced! Please leave a comment on this post to tell us what you think of the new products and you will be eligible to win big! You have until 7am EST, August 14th to leave your comment and be eligible to win. Only one comment per person please. One randomly selected winner will be announced on our August Release Winners Page before noon EST the same day. Thank you for stopping by today and best of luck with the contest! I am always so amazed at how much talent this team has. I love it all! Oh such cute projects. Very clever! I’m not a coffee drinker, nor do I like anything flavored coffee. But these cups and cozies are just so “CUTE”. What a great idea for fun coffee gifts! Ok. That’s fab again! Off to make me a latte! The coffee cozy die is so thoughtfully designed! I see many coffee cozy gifts ahead! Several years ago my sister gave me a reusable sleeve and I have really liked it and still use it almost daily! I am looking forward to making and giving my own custom cozies! Especially with that great tag detail! Oh my! Love this coffee concept. It’s shot to the top of my want list. Love the projects. The coffee cozy is too cute! Looks like another great release! That stacked cups image is adorable! It looks like it would be fun to color with Copics or colored pencils. I’m not a coffee drinker, but those pretty patterned cups remind me of a cozy kitchen and a hot cup of tea of hot chocolate. Great samples here and by the DT. What a great way to enjoy my morning coffee! Ahhhh-mazing! I am one of those rare non/occasional coffee drinkers too, but I know plenty of people who drink it. This coffee ensemble is going to make Christmas a LOT less stressful this year! 🙂 Thanks PTI! Wow, this looks amazing! I’m having visions of making felt coffee cozies to sell at our fall craft sale…. How clever…love the coffee projects. Fabulous samples again and the “coffee cozy die” is just great. The coffee cozy is such a great idea. Beautiful cards and projects starring one of my favorite things. To be honest I don’t drink coffee but you have plenty of other products that I want/need! ooooh, boy! A coffee set! This one looks like a WINNER! Can’t wait to see the whole thing. Aw, darn it. I was hoping to not like this set. The coffee cozy put me over the edge…so cute!! So much wonderful inspiration! Great job to everyone! I’m an absolute coffee fiend I love this release! I’m in love with latte love. Great projects today. I love coffee and I love these designs! Wonderful and so fun. I can’t wait for this release to be available!! So many things I want to add to my wish list. As a certified coffee addict I give you BIG thanks for these sets! I especially love the look of the embossed & watercolored coffee cups. GORGEOUS! LOVE the coffee inspired release! Can’t wait to create cozy projects!! Great images and love the coffee cozies. The stacked cups in Latte Love are absolutely adorable!! Oh I am loving today’s reveal! I am an avid coffee drinker and these die collections are wonderful. I can’t wait to play with them! These are great gift ideas!!! Beautiful projects. coffee and stamps… nothing better! adorable cozy, super sweet samples this morning ladies. The coffee cozy details dies are so cute and can be used to add whimsy to a lot of designs. Oh these are going to have to be a must in my collection. So many people in my family are coffee drinkers. Love the cozies. Wow…I truly enjoyed looking at these beautiful cards while enjoying a cup of coffee!!!! Great addition for all those coffee lovers…. This coffee set is just fantastic! You hit a Grand Slam with the Coffee Cozy seta….absolutely amazing! I was drinking a cup of Kona coffee that I recently picked up in Hawaii while I was read today’s post. It was a perfect way to start my day!! You and your team rock! I’m so loving the Latte love cups!!! What a super cute set! I thought I had seen (and bought) enough coffee and tea stamp sets but I think I “need” this one too! I think I love Papertrey Ink more than coffee when I see these super perky stamps and dies! Awesome! I love the stamp set and coffee cozy dies featured today. Can’t wait to play with them! My two favorite things: coffee and stamps, what could be better? Loved all the coffee projects. These are a wonderful addition to the PTI products! LOVE the coffee sleeve and all the possibilities! Beautiful cards and projects from all!! I love all these items today. I hope lots of dies were ordered. Can’t wait to hop around to see what the other designers have. Love love the coffee cozy details! I love this set a latte!! There are so many ways to color the images . . . I can’t wait to play! Those coffee projects are great. And you all made such a beautifull cards with this set. Wow, that coffee cozy die is everything you’d ever want and need to make those cozies! So sweet and cute! I love every detail! I love espresso, so no coffee cozy for me … but I like “coffee cozy details” they would be lovely for cards and other projects. After loving Apple Prints so much, I was convinced I was done shopping for the month. But now… Oh my goodness, the Coffee Cozy is sooo cute! What a great idea for Christmas gifts! Love it, & the inspiration is amazing! I don’t like coffee, but I really like that stamp set! The cozy is just too sweet and the samples are amazing! I absolutely love everyting coffee themed. I have been looking for something like the coffee cozy die for a very long time. I don’t sew but I really could make this work for me, either hand stitching or velco perhaps. Love it! LOVE today’s group post! So much inspiration! Great cards! Very cute gift ideas! I’m not a coffee drinker, but many of my friends (and my older son) are coffee lovers! Awwwww, how cute are these coffee cozies! Love the gifting possibilities! I love coffee! What a great idea and they will make great gifts! Loving that Coffee Cozy die!! Absolutely fabulous projects today!!! Love all things coffee, this would be a great addition to my “small” collection of coffee crafty goodies. I love the coffee cozy== so many great possibilities for gifts!! Awesome!! What great gifts these will be! The mailman, the paper boy, Etc. Family add gourmet coffee biscotti…the uses are ENDLESS! I love this idea! TFS ladies GREAT work! That Coffee Cozy die is A.D.O.R.A.B.L.E! Love the clever design of the coffee cosie dies and the fact that they can be used for any type of drink. Such a great idea for those special personalised gifts! Such fun gift ideas with this set. I love all of the different looks in the coffee cozies. Thanks for the chance to win! Love love the latte stamp set! It’s so adorable and I just cannot wait to make cards and cozy to give out with Starbucks gift cards. I pretty much love this set/dies – cannot wait to create with it! I love the attention to deatil in all of the sets but do love the tiny tags on the coffee cozy. Love, love the coffee sets! I give away a lot of coffee gift cards during the school year and have been looking for just the right stamp sentiments! I’ve found them! Woohoo! 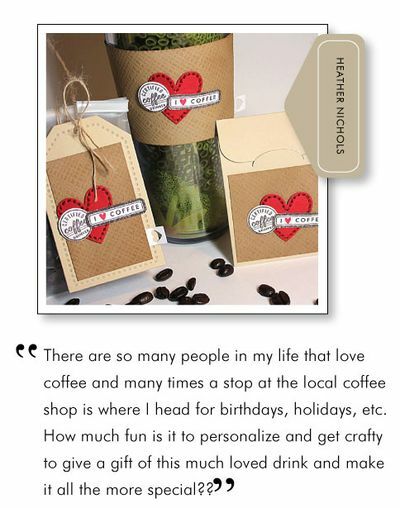 Love Cristina’s idea for personalized coffee cozies! I have a Latte Love for coffee. I love giving gift cards for my adult relatives for Christmas. I love coffee!!!!! And this stuff is adorable! If one is in to coffee–delightful! Great inspiration, great projects…this makes me want to start my holiday gifts right now! Keep those ideas coming…thanks as usual for a great start to my day. What a great stamp set and I just love that cozy die set, the details are so adorable 🙂 Thanks for the amazing inspiration today ladies 🙂 Off to get me some coffee!! I am crazy about Latte Love. It’s whimsical and love the sayings…great job! So much fun! I see coffee cozys for all my little gifts this Christmas! I love this new release – I want it all! 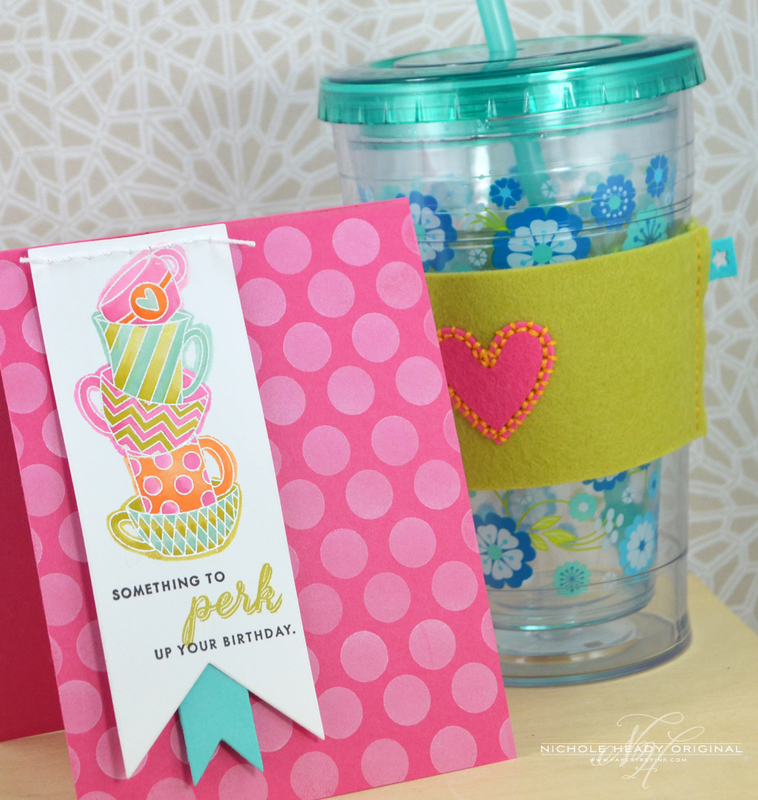 The coffee cozy is such a great idea.That stacked cups image is super cute! Ooooo! Just love that coffee cozy! Almost makes me wish I was a coffee drinker. 😉 Very cute! i am not a coffee drinker myself, but i do give a lot of dunkin’ donuts gift cards. these will be perfect! thanks. My Ohhhh My, this Coffee collection is going to be a MUST Have for ME! I have a sleuth of caffeine addicts that this would help me make some great projects with. I can’t wait to get started on these for gifts! Christmas just got a bit easier! Thanks PTI. Well I love the coffee stamps and dies a “LATTE” TOO! Can’t wait to try the cozies out! I, too am not a coffee drinker BUT there were many cute ideas today. I liked Nichole’s stitching on the kraft/melon berry card and Lizzie’s faux letterpress with the impression plate (gotta try that out!). Thanks ladies! Not a coffee drinker myself & don’t have any fanatics in the family either. But I do think this set is really cute – and all the ideas the team came up with are awesome! Love, love, LOVE the Coffee Cozy Detail dies! So fun…I guess I should learn how to sew better! Oh, I am so in love with all the wonderful coffee themed items! I have friends that roast their own beans and then the ones who just love their coffee! Everything here is so fun and would be great for celebrating them! I’ve got a buzz just from taking the sneak peek! I love, love, love, all the coffee items especially the coffee cozy dies. These cozies would be perfect paired with a gift card to my favorite coffee shop! The release today is like cream in my coffee… gotta have it! Oh boy, this is seriously going to be a large order once again this month. Great inspiration and great idea for some gifts. I love the coffee cozy dies! The little banners are such a cute detail!!! The coffee cozy die will make such fantastic gifts. What a super cute set of stamps and dies. I love the idea of making gifts with this set. 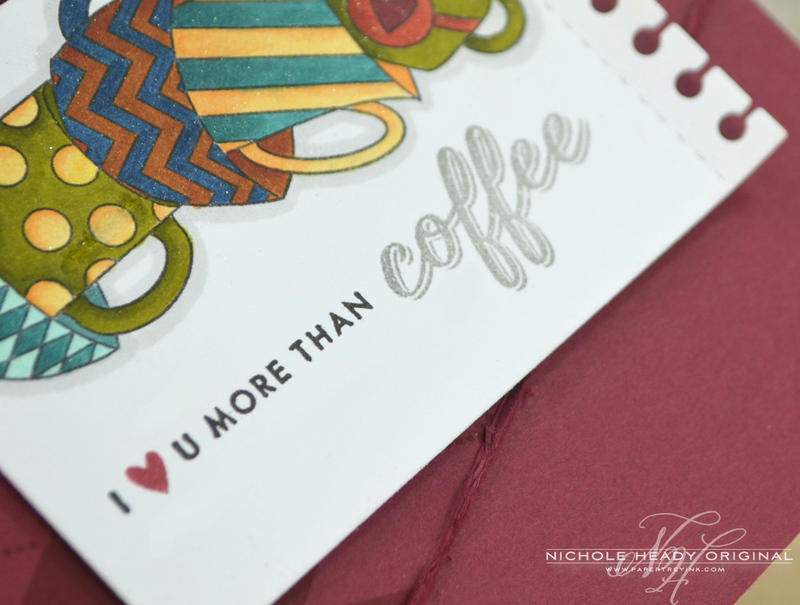 LOVE love LOVE coffee and the new dies and stamp set! Adorable! Most days, the only thing that gets me out of bed in the morning is the thought of coffee! I can’t wait to get this stamp set! Brilliant! What a cool concept to make the cozies. Can’t wait to get these dies! This is going to make awesome gift sets. Can’t wait to start sewing. Yep, I love all things coffee…just added a new kitten to our family and we named her Latte! The coffee cozy is such a fun idea. Thanks for the inspiration. Wonderful post today! I’m loving all the coffee themed products and the sentiments are perfect! Love the Coffee Cozy. I’ve seen teeny mini albums made with it. Must get! Latte Love stamps look fabulous! That stacked cup image is so sweet! 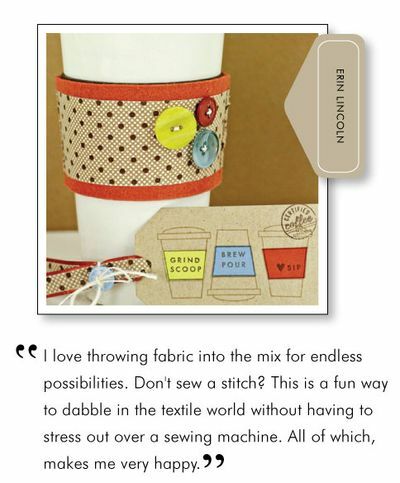 Great inspiration–I especially love the stitching dies! Love love love it all!! I have some friends and family who are going to get some pretty awesome coffee gifts this year. Thanks for making such awesome products. Who doesn’t love coffee. Cute stuff. today’s post just makes my heart happy. love, love, love these coffee themed sets! I love love love the Latte Love stamps!! Love the bright colors and contrasting thread on your first cozy (well really…love all of them but the first ensemble is the one I love!)! I’m not a coffee drinker (love my Cherry Coke and Hibiscus tea in the winter) but I can truly envision using this set and die for gifts for all the coffee drinkers in my life. Great release as always! Such cute projects! I can think of lots of coffee-lovers in my life who would really enjoy these! Such cute projects from everyone! I love today’s stamps and dies. I love coffee (and tea) and I need the cozys on all my cups, hot or cold. What a wonderful idea and great stamp set too. I think this will pair up well with the tea for two sets. I love the little stacked cups! So cute…and the coffee cozy is going on my wishlist. So much to love this month. Thank you so much for making a coffee cozy die. As usual, I love the versatility of these dies. The tiny tags add that extra special touch. I can’t wait to start making holiday gifts for teachers and friends. It’s amazing how talented this team is and the beautiful cards they come up with daily! Great team. Can’t wait the coffee cozie is a great idea, will be making many for all my coffee drinking friends. What a fun set…and great inspiration. Can’t wait to see more! Oh my gosh…I am head over heels for today’s release! Everyone’s projects were so meticulous and beautiful. My mom is a java junkie with a coffee-themed kitchen. I can imagine so many projects with her name on them! I cannot wait to get my Copics on that stack of cups from Latte Love! Well done! What a great day of inspiration. I love my coffee and so do my friends and I’m seeing some really fun gift ideas. I love the Coffee Cozy collection! I love these cozies! The are perfect gifts for the coffee lovers out there! Good blog post to see early in the morning – helps wake me up!! Thanks for the great ideas. I don’t drink coffee, but a lot of my family and friends do and this would be a great little gift to give them all. Great idea! Such a cute idea and this would make a fun gift. LOVE the coffee cozy!! This will make fab Christmas presents!! Adorable! The stack of cups is just perfect and all the samples are soooo perfectly colored in! Love it! Great projects! Will be fun to work with these. Love all the details of the coffee cozy! I LOVE coffee, so this release is definitely me! I am not much of the sewing type but I think I will give this a try, you make it look easy! Oh my goodness! So much fun! I love those dies! 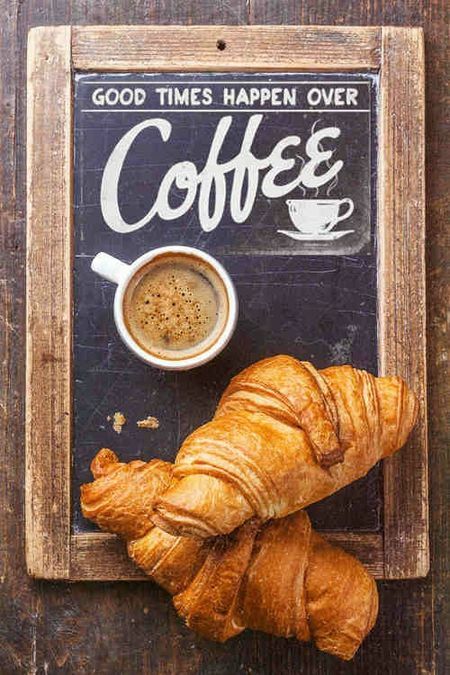 Coffee and croissants are my favorite! i love everythng about today. You’ve sold me! I was thinking earlier that I could probably go without getting anything this month. Well, that’s gone! I LOVE the coffee cozy and all the dies and stamps. Everything! I am in love with the coffee cozy and it’s sweet little details! Can’t wait to get my hands on this baby! I love today’s product showcase a latte! I have several coffee lovers to give gifts too and the wraps would be so much fun to play with. 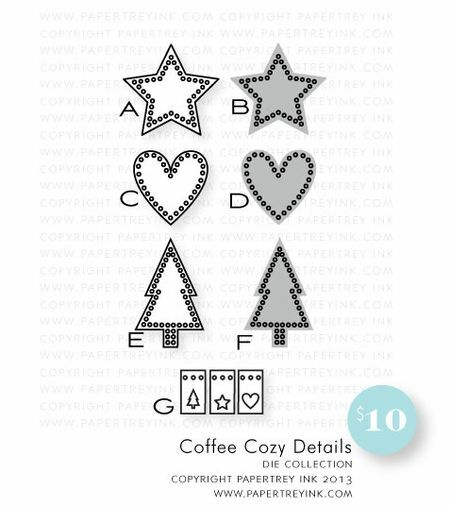 Love the coffee cozy die & stamps – we gift a lot of coffee gift cards and this will be the perfect set to make the cards! What a perfect set since I became an official coffee drinker a year ago!!! The samples are just precious and l can’t wait to make a personalized coffee cozy! The Latte Love set is sooooo cute! Everyone in my family drinks coffee…I need this set! Sitting here with my cuppa ‘eyeing’ those cups! Oh my are these the cutest coffee cozies ever! And love the cups! Very cute projects! I love the stacked cups. While I don’t drink coffee myself, that cozy die set is too cute! Great ideas. That coffee cozy is everyone’s wish come true! Love the stitched shape details! More great products, can’t wait for the 15th! Oh my gosh! These new coffee-themed stamps and dies are FABULOUS!! Love this concept and all of the sample projects! PTI never ceases to amaze me!!! I love these dies! I immediately started thinking of all the people I *have* to make these for. Thanks for such great ideas! These are fun! Love the shaped dies with the holes for stitching. This post has me wanting to do some “stitching”. Great projects. 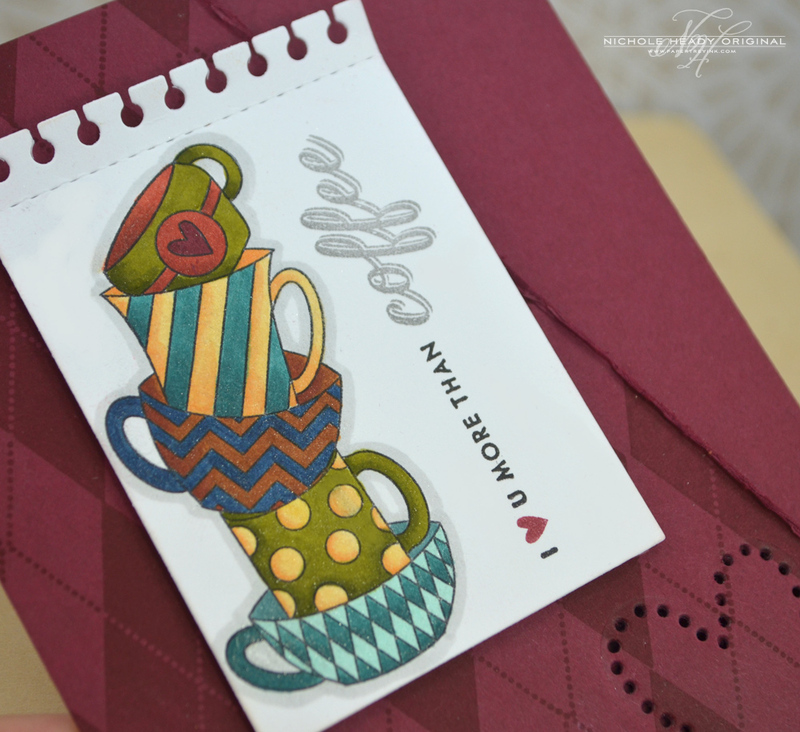 I love the coffee sleeve die and the stitched shapes are brilliant!!! The cozies are going to make wonderful gifts. I love the holes for stitching. They’ll look cute with blanket stitch as well. What a great idea. All the inspiration is wonderful ! Love the coffee theme ideas! Thanks. Absolutely beautiful projects done with the coffee dies and set. I love the sentiments from the coffee set, it probably will be in my basket, so I can make co-workers some little gift for Christmas!! Once again, you’re right on trend. Coffee is all the rage right now. Great samples. Such cute sets and great inspiration today! Cool ideas. Love the colors you used together on each project. I love coffee and really like today’s introduction! Erin’s dies are wonderfully thought out and I can’t wait to use them! Can I just say WOW!!! I know it is my fall-back phrase! But SERIOUSLY! The details are astounding ~ the little sew-in tag! WOW!!! Super Cute! Love, Love, LOVE!!! Love all the design team inspiration. Can’t wait for release day! Wow, so creative! Love all the variations you showed today. Making a custom coffee cozy is such a great idea! 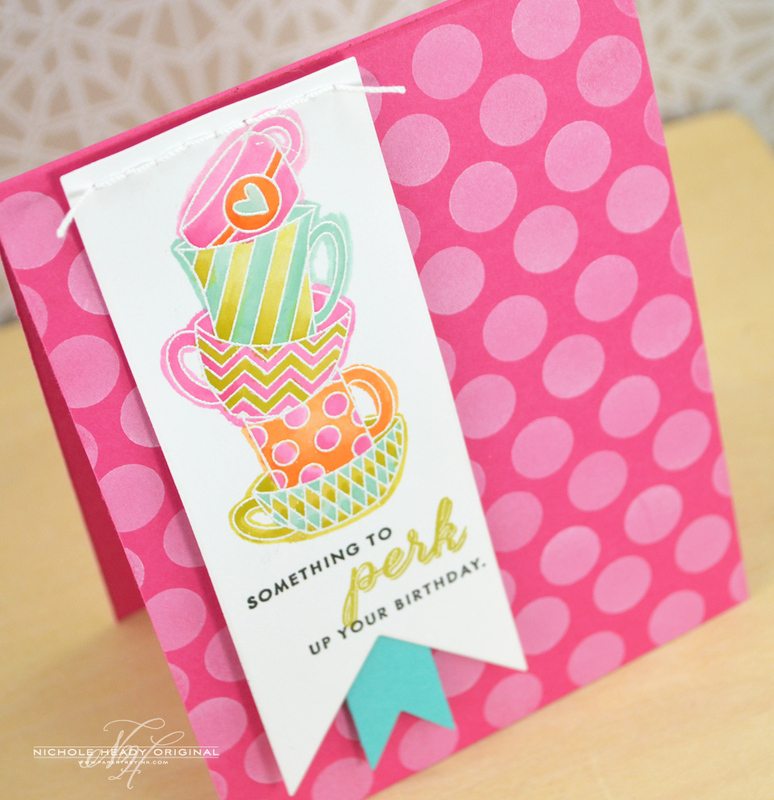 Today’s post will be sure to”perk” everyone up! Great projects! Sooo cute!!! Love the coffee cozy and the great ideas. I love this! What a great design for the stamp set and dies. They will get a ton of use. All the projects were amazing! 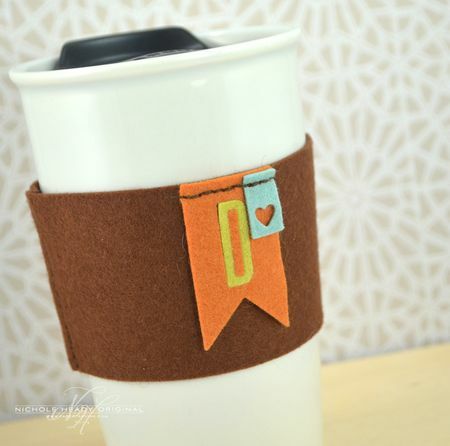 That coffee cozy die is absolutely brilliant and I love that you can add the stitching lines to it. Makes it easy for someone like me who doesn’t sew. That stack of coffee cups is so cute! What a great idea for homemade gifts too! Yummy coffee products! Those coffee cozy dies are so versatile! Too stinkin’ cute. I definitely love the “love you more than coffee” card because, that’s sayin’ a LOT. Lots of wonderful inspiration from todays fun release! I LOVE everything introduced today! The Cozy Detail dies can be used for SO MUCH. I see embellishments for scrapbook pages, tags, decorating gift bags, Christmas packaging, etc. Makes you want a cuppa! Love all the new coffee stamps and dies. I especially love the coffee cozy dies! I am excited about the coffee sleeve. You are all so creative!!! I love each and every project! So, so cute! It has me thinking about some really great Christmas gifts! Wow the samples are all fabulous! Such creativity on this team! cards and more all about coffee. I love the coffee cozy – so cute!! This post perked me right up this morning! Just sayin…but I love, love, LOVE this release! 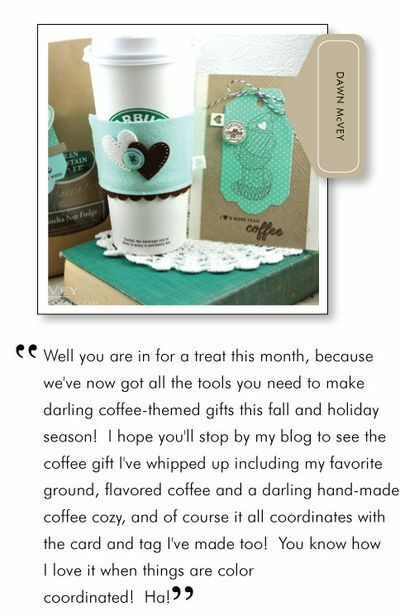 I am not a coffee drinker, but I can see using these sets for cute cards and gifts for my family and friends who are! Love all the samples today. The Coffee Cozy and Coffee Cozy Details are such a fabulous idea. I love all the samples and ideas you have given us. Love the coffee projects! What a wonderful way to give a gift! A must have for sure! the possibilities are endless with this one. Gift giving and card making! This is my favorite release! ADORE the coffee themed products!!! I love the fantastic inspirational projects from the DT too. Oh, and I thought I would be safe this month…NOT happening! This coffee set and Cozy dies are so right up my alley. My entire family are coffee fanatics so these stamps and dies will most definitely be coming home to me! Oh, and BTW, Erin is a GENIUS! What a fabulous idea!! Love the coffee cozy. Great gift ideas for my coffee drinking friends. All of these products are so much fun. 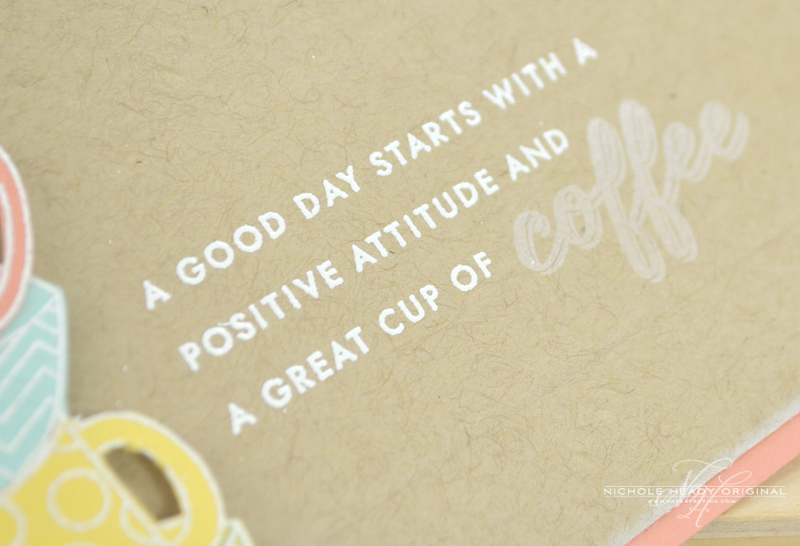 I am an avid coffee drinker and the sentiments in this set are dead on! Great stuff from the design team as well. All the DT projects are wonderful today! This could be the go-to gift set for sure! Wow, fantastic day at PTI. I ordered felt about 3 years with the intention of making coffee sleeves. Never happened. Maybe now I’ll be inspired to get that project off the ground?! What a great set to build and build gifts out of – Great JOB! Loving all the coffee projects! Such talented designers! I don’t drink coffee, but was excited to see the tree, star and heart are sold separately so I can enjoy those design elements. Love that technique of embossing with white embossing powder and using water colors, it really makes the colors pop! There is a lot of new goodies and inspiration, but I still can’t get over how much I love Polka dot basic II!!! I bought the Clever Barrette Cover Dies at release time and I’ve been so pleased with the crisp, clean stitching holes they create. The Coffee Cozy Details Dies will be on my list. They’ll make it easy to create quick and creative cards and craft projects! Ok, I know what everyone is getting for Christmas. Thanks girl for the inspiring projects. Only PTI makes this possible. Such a beautiful job!!! Can’t wait to get started on some awesome coffee projects for gift giving this Christmas! I love coffee and I love Latte Love. Those coffee cups look so fun to color in, and the possibilities are endless. 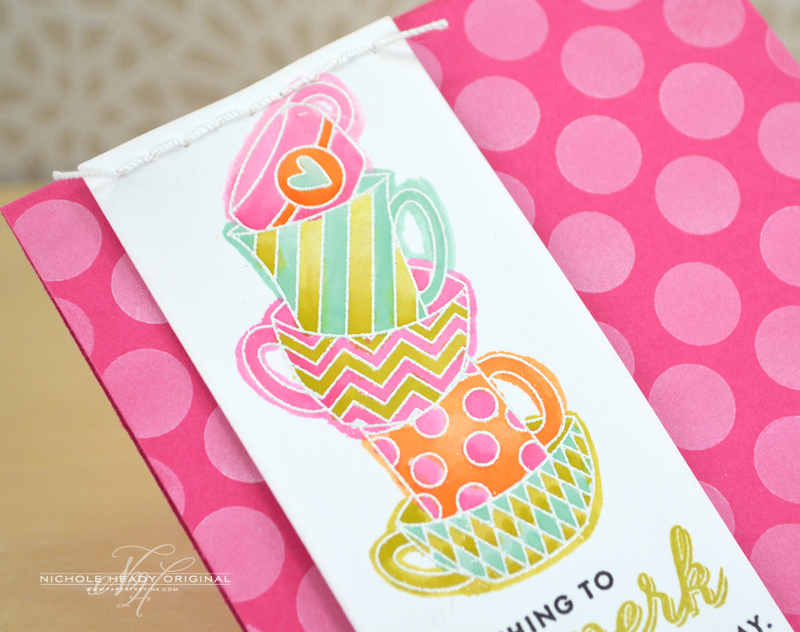 This was a very fun group post with lots and lots of great uses for even a non coffee drinker to use this collection. It’s all in the details, you never cease to amaze me. Excellent selection once again. I love all the fun coffee cards and the clever ways the coffee cozies are decorated. It’s an understatement to say I love coffee so I am very excited about today’s post. Adorable stamp set and the cozy is the hottest thing goin’!!! Super cute samples! So fun too! I LOVE Coffee and anything coffee related! SO, can’t wait to order these sets! My whole family is coffee drinkers and I have many friends that love coffee also, so this set would get used alot! Love it! Papertrey Ink is certainly putting me in the mood for the fall season. Loving the inspiration. Can you say LOVE?!? Love that coffee set!!! I am in coffee/tea heaven! The cozies look like so much fun and I LOVE the Details dies. 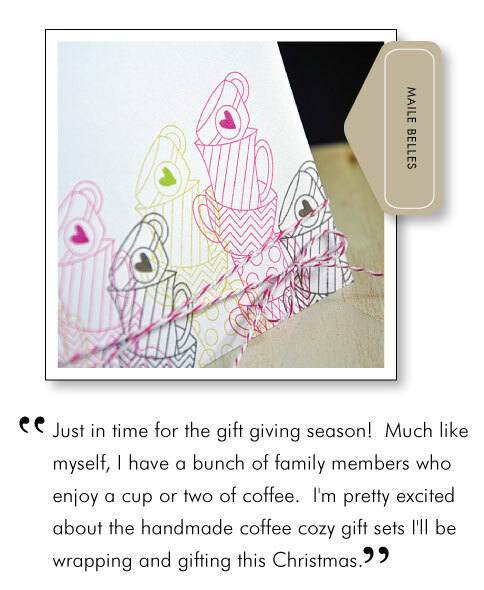 Felt, coffee, paper, thread and personalization…what more could you ask for? Those stacked coffee cups are the cutest…. You have no idea how bad I need to win one of these gift certificates this month! Seriously, amazing amazing projects by the DT today! This is why I started buying PTI so long ago…….fabulous!! Love all the new coffee items! Love the coffee cozy … so cute!!! What a cute idea and perfect for all coffee drinkers! What a great idea! I love coffee and have a lot of coffee drinking friends. The coffee cozy idea is so dang cute. I see awesome Christmas gifts here. I love this set. As usual, there is so much to love. My favorites are the coffee stamps and Mum’s the Word. Can’t wait until the 15th! Love this idea for coffee drinkers. Fabulous projects, as always! It is so fun to see the different ways that each designer uses the same materials! Love all the creative creations. The DT rocks!!! Ok, there is way too much good stuff in this release and we still have a day to go! I am loving the dies and the stamp set. I’m really going to have to make some very tough decisions with this release! I am a coffee addict and these dies are just the ticket. Love that the stitch holes ae die-cut too! Coffee is not my guilty pleasure but I sure know a lot of people who love the stuff. This set and die will come in very handy! Great job. Love the coffe cozy and detail dies! Such inspiration by all. I know the perfect, caffeine addicted people to give cozies to for all the holidays. I’m surrounded with them and your DT sure gave me a bunch of ideas. Love this set. 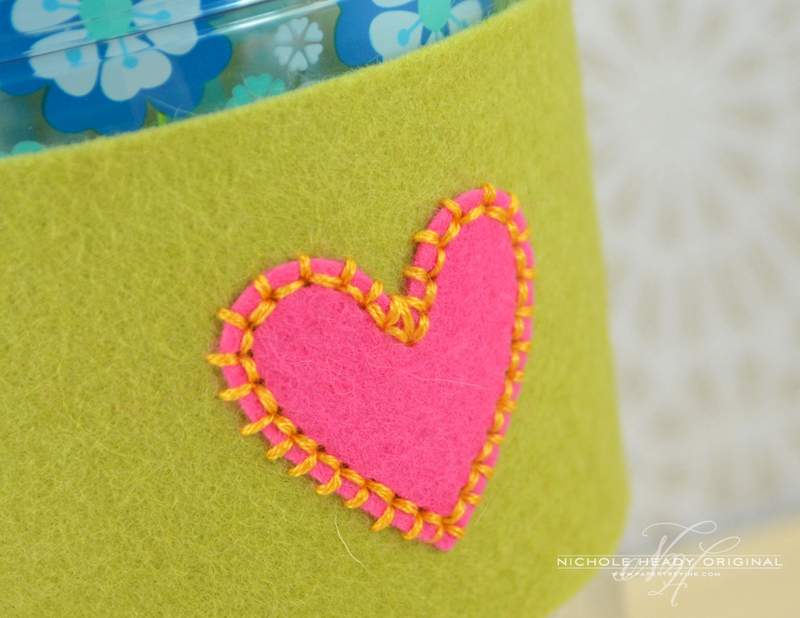 I am absolutely in love with the Coffee Cozy details – How stinking cute is that!?!? Love everything and it all looks doable – That is what gets me so inspired at this blog! What adorable projects! The cozy “accent” dies are super adorable! I’m not a coffee fan but may have to get this for the coffee lovers in my family! I LOVE COFFEE and what a great set! I’m not a coffee drinker but I know quite a few people who are. (My DH for one!) This Latte Love set is a must have. I really like Lizzie’s Burlap IP also. Perfect set just in time for the holiday gift-giving season coming up! I am not a coffee drinker, but these samples make me feel warm all over! The coffee sentiments are really cute! Oh my! Even though I’m not a coffee drinker, all of my friends are. These will make awesome gifts, and you gals knocked it out of the park again this month showing us a great variety of ways to use everything. I love this stamp set, definitely a must have!!! thanks for the inspiration!!! I have many coffee drinkers in the family and I can see a lot of different ways I could use these for gifts. Thanks for your examples. 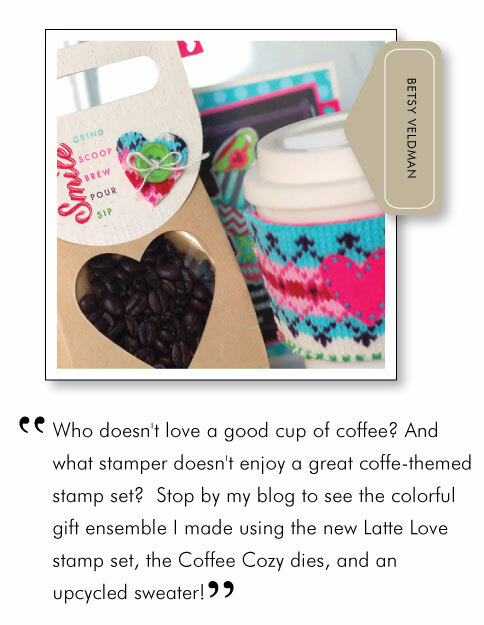 The cozy and stamps are adorable … perfect for for gifts my coffee-addicted friends! Thanks for the awesome inspiration (great instructive video, Erin) and the creativity! Not a coffee drinker…but todays projects are adorable!! Can’t wait to get new PTI goodies!! Absolutely adorable!! The coffee themed stamps and dies are too cute! So cute! I don’t drink coffee, but I want this set! Love this set! This will make creating holiday gifts so easy – beautiful job everyone! I just love those stacked cups! They’ll be perfect when giving coffee or tea gifts! How cute! My family and friends are all coffee fanatics. You may not want to know some of them if they haven’t had their java in the morn. These are adorable. Would love to win! The coffee cozy details are so cute! I may have to get into felt just to sew with them! I’ve got a whole “latte love” for these projects! So fun and cute! I love coffee, so I can really relate to the sentiments too! Another wonderful group post! Thanks for the inspiration! OMG, the cuteness overload! I love coffee, what a great gift idea! Suddenly craving coffee, I wonder why? Great release this month, can’t wait! Coffee Cozy goes on my LONG with list! Great cards with lots of inspiration. Thanks! This is such a fun set. I’ve enjoyed seeing everything the team has created with it. What a great grouping of products if you wanted to make a little something special for your friends. I love coffee and everything associated with it, so this month’s release is a must-have for me! Can’t wait to try and make my first coffee cozy. OH MY GOSH, OH MY GOSH, I must have it. That is the cutest!!!!! I love everything coffee! Thanks for showing versatility with the stamps and dies. love the stamp and the heart die. I love the coffee cozy and embellies. I love crafting items that make superb gifts and Erin’s new dies fit the bill perfectly. I love every project made by the DT. Oh, that coffee cozy is just to die for!! So cute and so many possibilities – I LOVE it! These are all so adorable. Perfection! I love coffee and I love these new peeks, can’t wait to see more, lots more! Oh my goodness, I did not see that coming even after the sneak peek. I love coffee…juice of life. The is a super, super collection and again great showing ladies. So excited to add the coffee images to my collection! These are really fun. I would never have thought of a die for a latte cozy! Love what the DT created!! Another day of amazing projects!!! Love all the coffee stuff! These dies are definitely coming home to live with me! Great projects! I’m not a coffee drinker but I love the coffe cozy die! Darling examples! I’m definitely buying this! I’m loving the coffee cozy, but the stack of coffee cups is super cute! Totally a adore the coffee cozy and coordinating stamp set. I think this is my favorite release ever. Wow how great to see the new releases come to life. Love the variety from each designer. This is one of my favorite releases. This will make great teacher gifts. Can’t wait to order. Can you say stocking stuffers galore?!!!!! This is going to be so much fun to use! 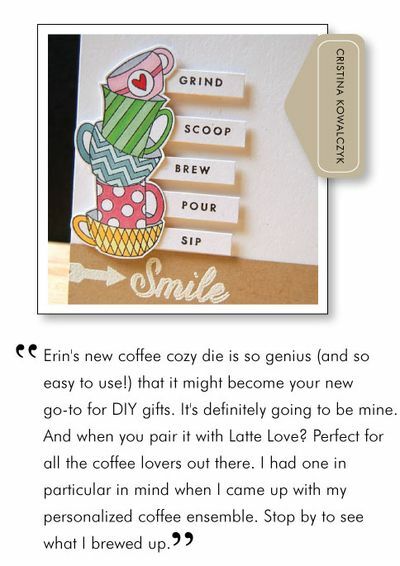 Love the ideas for Latte Love! Loving this month’s releases! Colored (in any color combo) or not those coffee cups are delightful. Oh my!! How CUTE IS THIS!! I want it to make some gifts for people for Christmas. A little cozy, a little tag, a card and a GC-such a cute gift idea!!! This set is adorable!! Love the coffee cozy…so cool! I love the stitching possibilities with the cozies! So creative and fun for gift-giving! What a fun new set!! Fun new stamps and dies! Great DT inspiration too. Thanks for chance to win! Gorgeous projects, Nichole! I am totally LOVING the new coffee cozy die..a real must have for me! You are speaking my language today! COFFEE!!!! I love, love, love Latte Love – absolutely my favorite set for a long time! Great projects today…I can really see getting a ton of use out of the coffee cozy set making gifts for my nieces and nephews teachers this year! OMG! I never expected coffee cozies, VERY FUN!!!! Love the Latte Love set. The stacked cups image is awesome. Oh I love everything!! The little Coffee Cozy detail dies are so clever and fun!! I don’t drink coffee but almost everyone I know does. These projects are so darn cute and would make some great gifts! Thanks for the opportunity to win. Thanks for sharing all your cute ideas. Can’t wait to order. Oh dear, once again, the awesome is in the details, from the tiny thread elements to those darling little cozy tags. Thanks for so many great projects! 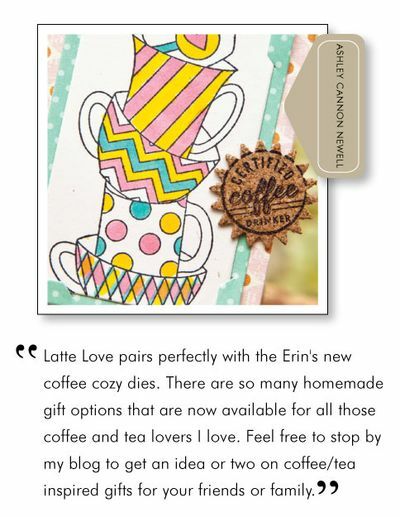 Loving the Latte Love stamp set and super fun cup cozy! Especially love Nichole’s more masculine card, Cristina’s coloured cups on the neutral background and Dawn’s card with the cups simply stamped on aqua mist. Fabulous projects from all of the DT! I personally don’t drink coffee but I have plenty of people in my life that do and last year at the holidays there were enough gift swaps that I could see getting all of the new items to do packaging etc for the holidays. Great stuff! Oh. My. Goodness. I am ABSOLUTELY in love with this release!! See lots of great ideas here and love anything coffee themed! Nice caffeine kick. I love the coffee cozy. I *love* coffee so I really enjoyed today’s post! That coffee cozy is the cutest thing – LOVE it! That coffee cozy could be used for all sorts of occasions! Such clever and awesome ideas always come from the entire team. This is just amazing! Love it. Coffee themes are popular today and this set capitalizes on that trend. 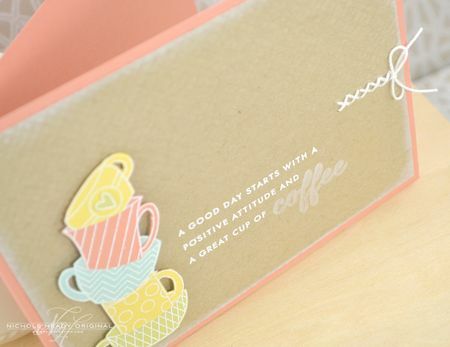 The coffeecozy die is so super cute, love the projects! By just changing the colors you gave a different feeling for the same Latte stamp set. Thanks for showing the color combinations. Love, love, love the stitch die set! Quickutz made a stitch die set years ago but I haven’t seen anything like it since – until now. I can think of soooo many uses for these dies! Super cute! Perfect for gifting Starbucks gift cards! Especially since fall is right around the corner! So many cute new items! How clever are those coffee cozies? Great projects – the coffee cozy is really fun. Thanks. OH my goodness…I really am in Latte Love! I love coffee and the combination of this set & that FABULOUS cozy & details is just too much fun! Can’t wait to get everything. I like this set a latte!? Seriously the release o far has been terrific! Love the coffee theme! Everyone’s projects were so beautiful. Wonderful projects from everyone. My family are big coffee drinkers, so I’m getting lots of inspiration this morning! 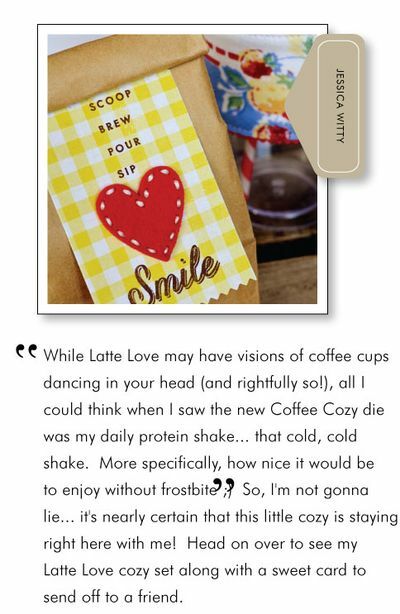 What dear and thoughtful gifts can be made for our much-loved coffee drinkers– love Latte Love! Oh I am so buying the stamp set! I love those adorable stacking cups. Thank you so much for all the great ideas! I know mine would prefer not to have a sweet heart or pretty star on his (but I like them for me! 🙂 )so thank you for a “manly” inspiration project! The coffee cozy and details is just too cute! I cannot wait to get my hands on those! LOVE LOVE LOVE these sets! Being able to make a cute cozy so quickly is fantastic. I’m already mentally picking out colors for my friends. The stacked ups are cute and ‘love you more than coffee’ is super high praise. lol These are definitely at the top of my wish list. I have a lot of coffee drinking friends. This set and the coffee cozy are going to be perfect. I’m thinking of other ways to decorate the coffee cozy using my other dies and supplies. The stacked coffee cups are really cute. Such neat ideas on how to use the stamp. This is so fabulous! Yeah, Erin!! Fantasttic products, i like the coffee theme! Fabulous samples too. As a raving and confessed Starbucks fanatic, I must say I am passionately in love with every single project in this post!!! LOVE LOVE LOVE!!! What a great idea!I’m a huge coffee drinker as are many of my co-workers. This will make a cute inexpensive gift for the holidays…. 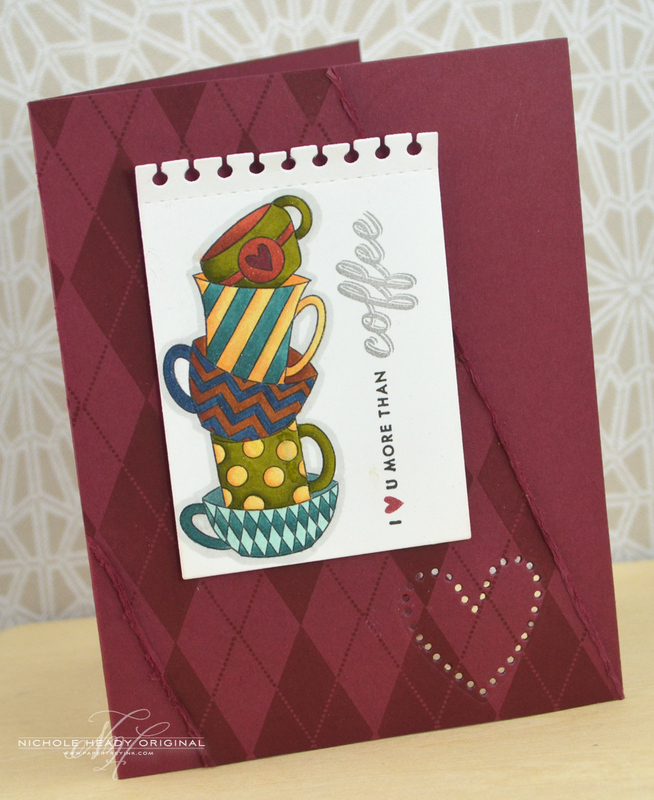 Love love love the new coffee cozy dies and detail dies sets! Erin knocked it out of the park with these dies! They’ll make great presents! Loved all the projects from everyone! The coffee cups are so cute and so is the coffee cozy. This is my 3rd try to leave a message. I’ve checked hours after the first two and still there is no comment from me. Hope this one goes through. Yummy stamps, dies and projects today! These will be perfect for several people in our family. Thanks for the chance to win a gift certificate! Fantastic cards and projects. I love the Coffee Cozy detail dies. So many cute projects today! I love the variety!! I love everyone’s creations! Erin’s dies are super. Makes me wish I knew people who get their coffee on the go. Fabulous artwork! Now all coffee lovers can unite! The cozy is very clever! I don’t know how many people in my life would use a coffee cozy, but I definitely want the details die to add shapes & little tags to all my future projects – adorable!! The coordinated gift sets are especially fun today. I love all the little touches added. Everyone is going “coffee” crazy! Love these products and the team projects. 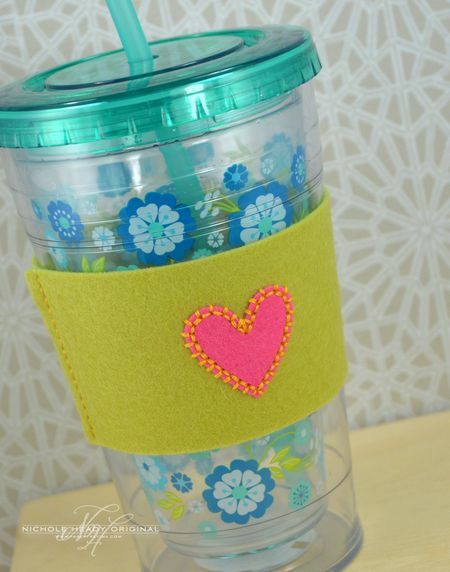 I gift reusuable cups all the time so this would be such a cute addition to the gift! Amazing! Wonderful projects and great gift ideas! As I love hand embroidery, love all the samples and the possibilities with this set. Ah, the coffee theme is killing me – I just love it! I cannot wait to make some darned cute teacher gifts with all that coffee goodness! Great samples. The first one is my favorite, love the colors used. I don’t drink coffee, but those cups are adorable!!! I also love the dies!!! I’m not into this coffee set which is good because I love everything else in this release. Oh, how I love those stacked cups! This set and the Coffee Cozy dies are really amazing! I love all the different looks everyone came up with using the same products. I am super impressed with the coffee cozy products and projects today! Love, love, love!!! The little star tag on the coffee cozy is SO perfect! This is my favorite gift idea you have come up with…ever! Erin’s dies are truly amazing!!! So excited to try them out! This has amazing unlimited gift potential! I’m super excited about this! Great projects today! 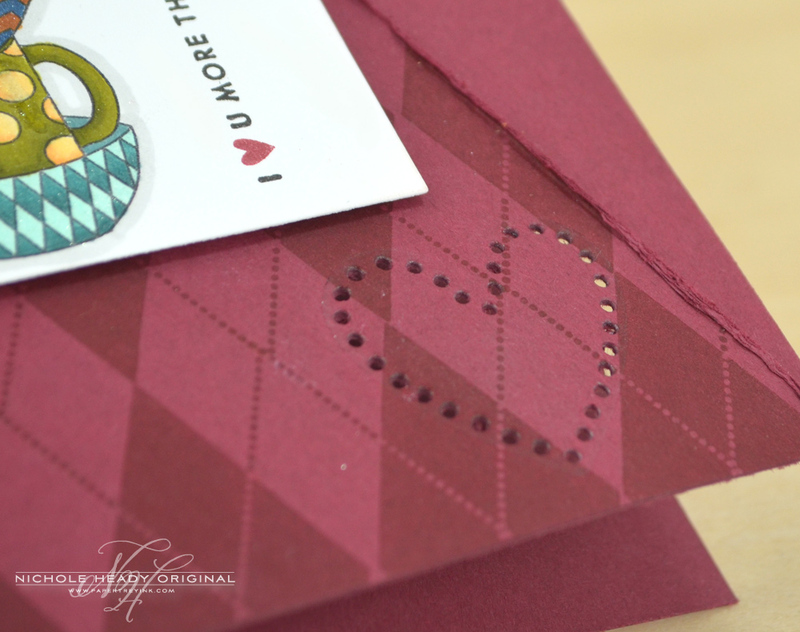 And I love that details die–I can foresee dotted hearts and stars on lots of cards in my future. The cozies will be such fun to make as gifts, and I can get an early start on them too! Those detail dies will get so much use, and I’d love more shapes too… flowers, a football, and the list goes on! Those cozies are adorable. Love all the cards too! OMGOSH! The coffee cozy is so what I would love!!! I don’t drink coffee, but I like the coffee cozy die and the cups. SUCH happy stamps and dies and projects!! All are so perfect for a coffee set! These are adorable. I really like the stack of cups, what a fun image! Looking forward to this release. Love it all! Oh my goodness! All the variations of the stacked cups are wonderful. Love all the projects. I have had the tea set for years, so it will be wonderful to have a coffee set. as always, the Design team is fabulous! Love those little tag dies…great added touch. Erin thought of everything for the cozy! Always impressive releases and projects from PTI & Co.! I love all things coffee and I’m really enjoying all the projects I’ve seen today. Looks like another great release at Papertrey Ink! I’m not much for coffee but these are very cute and the cozy is nice. Love the projects! Those coffee cups are so cute! Cute and clever! Thanks for the great ideas and for the chance to win goodies! Great new ideas! A latte to love! Well done – again! I love the new coffee set. It’s so cute. I don’t even drink coffee and I really want this set. The coffee cozy is so adorable, my favorite so far! Very cute. 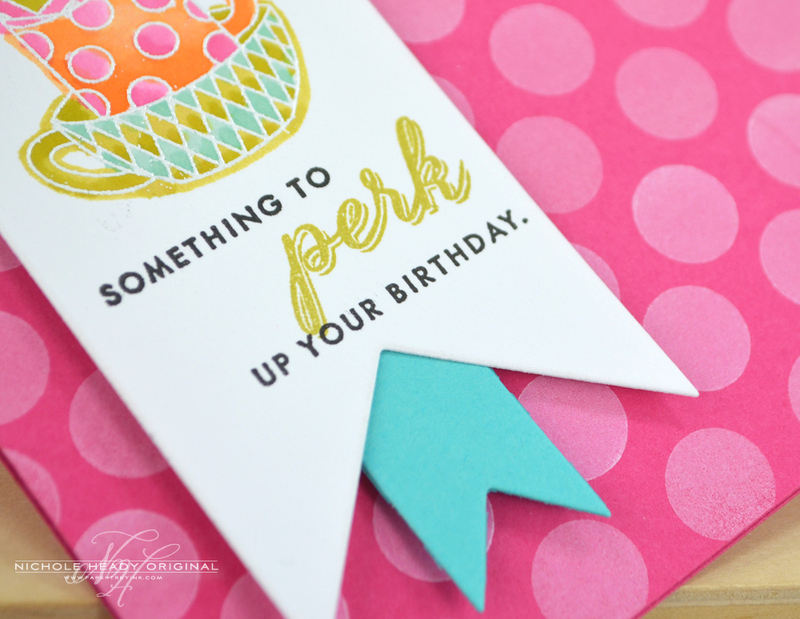 Love the BIRTHDAY PERK ME UP ENSEMBLE that you’ve created. I need the coffe cozy die. What a great gift idea. I love the coffee cozy die and I don’t even like or drink coffee. I see so many gift possibilities with it! I absolutely love these sneak peeks! I can’t stand coffee, but love coffee cups and all things related! I have an aunt that loves having a cup of tea with her sandwich and a book in the afternoon. Every Christmas I make her a set of stationery that she goes nuts over and it’s usually a coffee/tea theme. I absolutely have to have my cup of coffee in the morning or I’m no good to anyone lol. Such adorable projects shown in this post. Thanks for sharing! These would make really great coffee gifts!! Great ideas and the DT did an awesome job. Loving that cozy. Well once again the PTI ladies have hit it out of the ball park!! I was liking the release but now I am so loving it!! What great ideas and gifts are going through my head!! Thank you all!!! Love the coffee cozy! These will make a fabulous accent gifts for birthdays or the holidays. Great idea! The detail dies are incredible. I can see them being used to make the finishing touch on so many different projects. And the stacked mug image is almost worth the cost of the entire stamp set. Not really, but I’m trying to talk myself into it! Love those stacked coffee cups. Coffee ranks right up there with oxygen! That coffee cup cozy looks so fun! And I love all the creative projects and cards! I like these projects “a latte”. Great ideas! LOVE the whole coffee theme! What great gifts for the holidays, birthdays, just to say thanks! Totally a tea drinker, but absolutely love everything in this release! So excited for the 15th!!! Super cute idea! Love this for gifts. TFS. I have lots of coffee addicted friends and I see lots of coffee type gifts in the future. I love. love. love this a latte!!! ahhh, all of these adorable coffee projects just make me smile! i love love love the coffee cozy…i neeeeeed it! I have recently become a coffee convert… and am so excited about all the projects today! The Latte Love set is the cutest ever. I usually don’t like coffee cup sets but this one I love. Love the cozies and that stack of cups! LOVE the coffee cozy dies, and the new coffee set looks darling. My mind is whirling with ideas for Christmas gifts this year! Love the coffee cups, really cute. Love the coffee cozy! Such talented designers. I just LOVE this time of month! Cute coffee cozy! Great projects, can’t wait to see what else you got for us this month! My co-workers think I am nuts because I bring an airpot of coffee to work each day. I just love coffee so this set is perfect! These coffee cups are just too cute. They will be fun to make cards with and especially thinking of my special coffee drinking friends. Oh what gorgeous creations again today. Only problem now is, I need a cuppa after seeing all drinks containers!! Hmmm cozy coffee cup. Really love the felt coffee cup holder. I love the coffee cozy detail dies, especially the little tags. Thanks so much! What a great idea! Perfect for cute coffee gifts!! Awesome projects and I love these dies and stamps! Hugs! Wow, this coffee cozy is a great idea. Love it in all the cards and pieces in this post. Love, love, love, the coffee cozy dies, stamps and great inspiration. Thank you for sharing. What great gifts can be made with this die. Oh how super fun!! Love it! The sentiments with Latte Love are over the moon great! 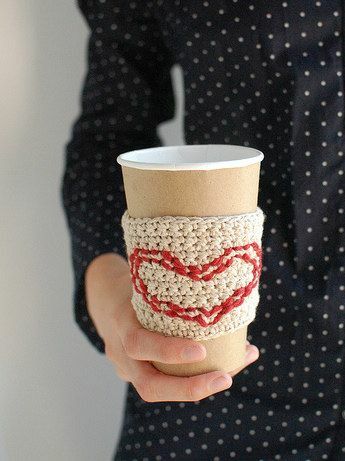 Love the coffee cozy idea! The patterns on the coffee cups are so cute! Wow, coffee cozy dies? Yes, please! Love, love, love. I love coffee and I absolutely love everything I have seen today! I can’t wait to get my hands on these products! Thank you for all of the inspiration! This is the BEST idea ever!!! LOVE!!!!!!! Oh what cute coffee dies and stamps! Darling inspirational ideas and cards! I love coffee and the new stamp set and dies. I used to make coffee cozies for people, but they were never as easy as they will be using the new dies! Love that little tag you can add too. What a terrific idea. So clever. I really enjoy team day. oh, my goodness what a wonderful set.. i just heart this..
I’m a coffee fanatic — love these new products!! I love all the cute coffee projects. The coffee cozy is so so cute. I can’t wait to make one of them for my daughter who is a great coffee lover. I’m not a coffee drinker but I could be converted, just looking at all the cute images, and fun things you can do with the Cozy dies! Coffee addict right here, this set would be perfect in my collection! Oh my God!!! I Love this coffee concept. It’s on the top of my want list. Love the projects…. I can’t wait to get the latte love. Thanks for the chance to win. I love the coffee cozy!! I’m a barista and would love to give as gifts. What a wonderful idea – thanks for the tutorial! Love the little accent pieces!!! Wow! I wonder how you hit the ball out of the park month after month after month! Consistently fabulous! Just ADORABLE!! Those cozies are the cutest idea! Love it! OMGee – these are absolutely to die for! I’ve enjoyed looking at all of the fabulous creations and can’t wait to see what others come up with after the release! WOW! This release just gets better and better! 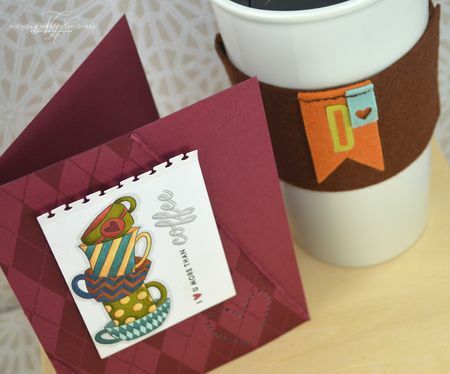 Love the coffee cozy and your cards are spectacular! I absolutely loved todays posts. What is it about coffee that makes me so happy? I think the cozy is adorable and I honestly hope you make a longer strip that punches holes so we can add stitch marks to cards. What a brilliant idea! Awesome ideas! love that little stack of cups! Love all the different colored cups in the samples! They look like they would be a lot of fun to color! There is a whole latte to love about today’s releases. 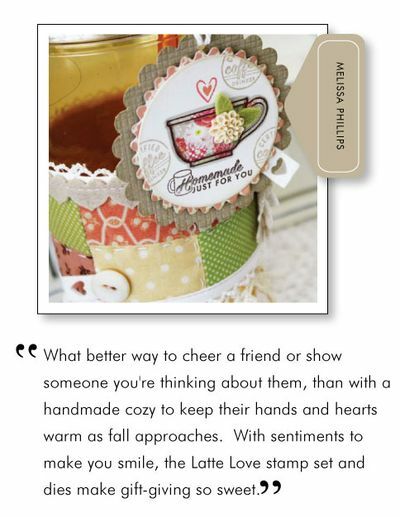 The stacked cups and sentiments are adorable and Erin’s Coffee Cozy and Detail dies will make for some special gifts. Such awesome products!! Love the new dies!! Clever and cute. Great gift ideas. What a great set for coffee lovers! I love coffee so I am going to love this release…. I absolutely love the Coffee Cozy Detail dies. So versatile and adorable! My favorite card is the first polka dot one, but I love the sweet touch that the heart die added to the last card. Wonderful designs from the DT – I am completely inspired! Love this set! I am not someone who can sew, but you have made it so easy to make home made goodies that look like I can. Love coffe, love today’s inspiration! The DT has outdone itself!!! I didn’t think the coffee cozy was for me until I wanted Erin’s video. I love it now!!!! I don’t even drink coffee and I need it! ……..loved today’s projects! Will be adding this stamp set and dies to my list!!! Wow, the coffee cozy is too cute. I am not a coffee drinker, but know plenty of people who are. These would make great gifts. Great projects everyone! More cuteness! Erin came up with some more adorable dies! These stamps are fantastic, love them. I’m a big coffee drinker and so are al my friends. Can’t wait to get them home. Wow! Another amazing and clever set. I can’t remember when I have been this excited!!! I am counting down the hours? The coffee cozy projects are all wonderful- what great dies! I LOVE Latte Love and the Coffee Cozy dies along with Coffee Cozy Details dies! Thanks for the great inspiration. I honestly let out a loud Whoo Hoo when I saw this release! I am a coffee LOVER, my friends are coffee lovers, my co-workers are coffee lovers, my relatives are coffee lovers…ya think I’m excited about this? Wow – endless possibilities. AMAZING projects ladies – my absolute all time favorite release! I’m in love with this set! It will be in my cart as soon as it’s available! What a fantastic idea, and a great gift for Christmas too! The possibilities are endless! Nicole, all of your creations are just wonderful! CUTE CUTE CUTE!! I LOVE the cozy die!!! It makes me want to start drinking DAILY Lattes!! HA HA!! FABULOUS ideas as always PTI team!! 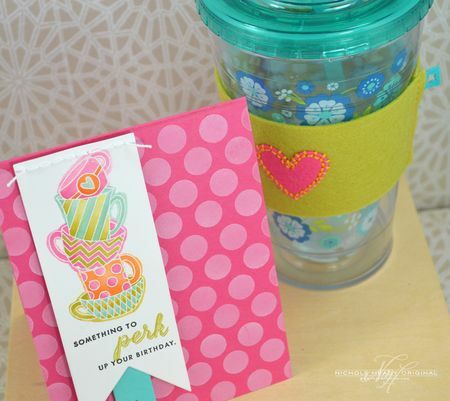 Love the coffee cups….such cute gift ideas! I’m in “Latte Love” with this set…. What a fun theme today! Love all the samples, as always! great cards and projects! love the coffee theme! The stacked coffee cups are adorable! Love these projects! Very creative! Coffee is my favorite beverage. Oh goodness! What super cute projects today! Cute, love it as always. my sister was just looking for a coffee cup stamp so I told her to check out this new set. Of course Nicole’s projects can sell any stamp set and this is no different. the team have all put their unique spin on todays projects. These are such cute ideas for the cozy!!!! Great projects, ladies! Okay Papertrey ladies-this just may be your BEST RELEASE EVER!!! I am a coffee girl and love to gift all things coffee(& receive of course!) so I am just thrilled to put my two loves together by stamping and die cutting matching cards and cozies. Top of my list! Love it! My two favorite things – Coffee and Papertrey Ink stamps. Oh life is sooooo good! Oh wow! Another must have!! Fun! I just love dies like this that can make little gifts! Perfect for coworkers! Great job! Love the stacked coffee cups! Oh coffee! How I love you so. Love these cards and those great stamps. UH…HELLO?!!! TOTAL coffee lover! 🙂 🙂 I’m in LOVE with this collection!!! These dies are awesome! I can’t wait! I love the little hole in the die cut shapes for stitching! Lots of Starbuck coffee drinkers in this family. I am always gifting w/ gift cards. This will be a wonderful set, just in time for the holidays. Love all the coffee cozies. I must have this die. Really love all the inspiration. Great cards! So many great gift ideas with these coffee products! Oh good Lord … the cozies are sooooo dang cute! I wanna make one for all my coffee lovin’ friends!! Super fun projects! Thank you for the chance to win! I really love your final project today Nichole and would love to know more about making that argyle background. The small details for the coffee cozies are sure cute! Thanks for the contest! 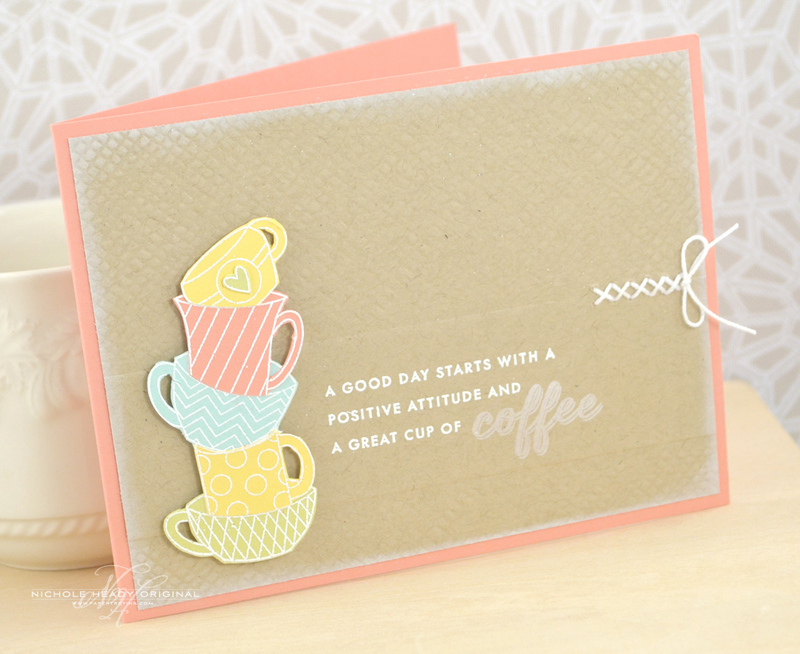 Love the coffee dies and the stacked coffe cups stamp! Love the coffe set. The projects were amazing. Thanks foe the great inspiration. Wow, what fun are these coffee cozies! Lots of coffee fanatics in my life so I know what to make for all of them! 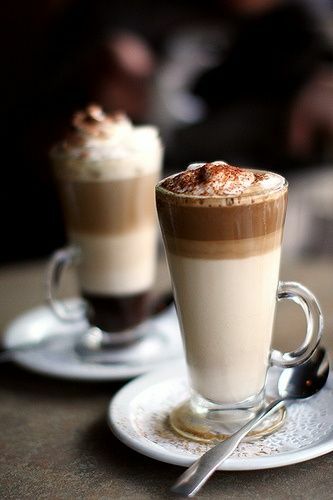 I don’t drink coffe but this ideas are delicious! I just love those coffee cozy detail dies. Those have far reaching, endless project potential! 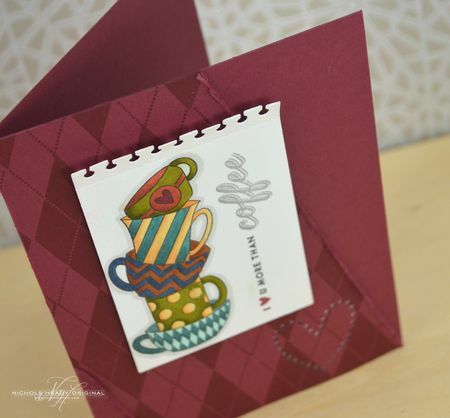 I LOVE coffee and coffee themed cardmaking stuff! Crossing my fingers! I just love the new coffee cozy dies. Erin’s tutorial was great and showed how easy and fun they are to put together. Can’t wait to try it myself! Too cute ladies…loving that coffee cozy die! Thanks for the chance to win! ACK! I’m in love with this even more than coffee!! 😀 Thanks for the chance!!! Wow! A great coffee set! I’m really loving the Rustic Burlap impression plate! Beautiful cards. I absolutely love the idea of a die cut that pokes holes for a shape! Nothing better than perfectly placed stitches! The cozy die looks like a great way to make some holiday gifts! love the stack of cups and that they would work well with the previous tea themed sets too! LOVE those stacked cups, they look so fun to color! Those stacked coffee cups are really cute. The little tag is probably my favorite thing about the cozy. I bought some paper coffee cups last year to hold some gift cards, and never did anything with them. This coffee cozy is the perfect idea for me! I especially like Heather’s cozy with the rustic burlap pattern and the pocket gift card made by Christina. Thanks for all your inspiration! As I sit here drinking my plain cup of coffee I am thinking of all the inspiring ways I could decorate my cup and cards. Great new designs. 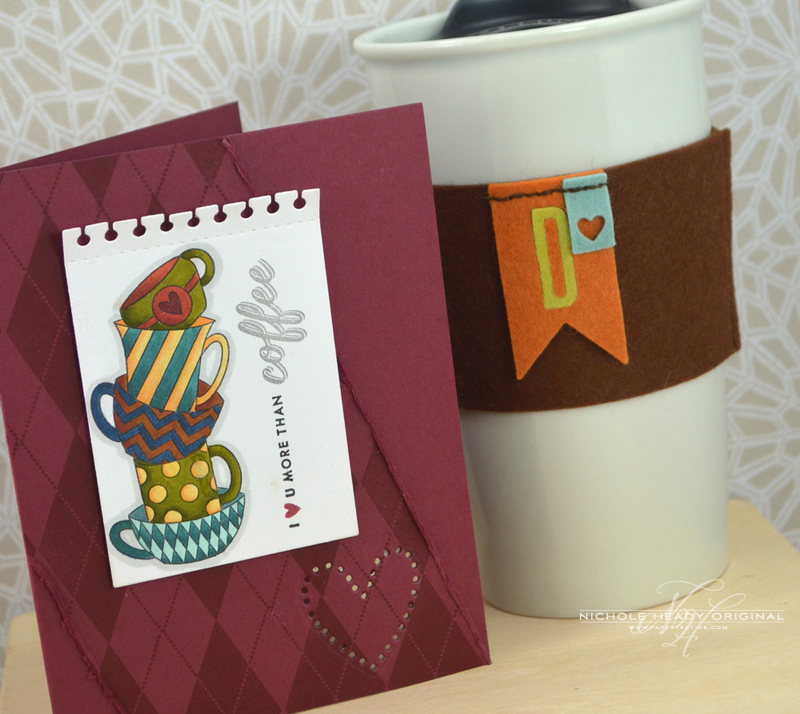 I am in love with the Coffee Cozy dies and add-on dies! This is a must-have for quick gifts and for myself. Love, love, love! Such great ideas in this release. Love all the coffee-themed ideas. So cute! Thanks for the ideas. Such a huge coffee fan and I’m totally excited for this collection. Absolutely awesome inspiration from the design team! Oh my goodness! I hope enough of the coffee cozy dies have been made — this will be a real hit and just in time for making Christmas gifts — I’m really excited about this set! Love the dies – I can see a lot of uses for those in the coming months. That coffee cozy is such a great idea!! I love it! Best die ever! So versatile! Love the projects…just had to Pin them! Holy Cow, wow! This is so Seattle- NEED! Amazing! I love everything coffee. Especially a chance to make my own coffee cozies out of felt. Great job design team. This is so darn cute!!! I am so in trouble this month! Oh so darling… This is a must have for an avid coffee drinker like me! I love coffee and do a lot of coffee-related gifts, so the new cozy die would be perfect.